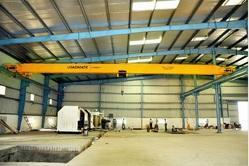 We are a leading Manufacturer of gantry rail crane and heavy duty gantry cranes from Surat, India. Hugely demanded in medium and heavy duty industrial operations. Our Gantry Rail Crane used in lifting and lowering large loads through a lift wheel or drum that is wrapped around by chain or rope. Made of Steel and/or fiber core these Electric Wire Ropes are in tandem with accepted industrial standards. Hugely demanded in medium and heavy duty industrial operations. Our Heavy Duty Gantry Cranes used in lifting and lowering large loads through a lift wheel or drum that is wrapped around by chain or rope. Made of Steel and/or fiber core these Electric Wire Ropes are in tandem with accepted industrial standards.